The point of departure for Murano Glass Art may be considered the document dated 982 in which a certain Domenico “fiolario” appears. Such an adjective indicates his profession, as fiole or phials were bottles made in blown glass and characterized by their chubby shape with a long neck. Before speaking of an art which in some way was rooted in the city and was of some interest to the Serenissima one must wait until the constitution of the “Mariegola” in 1271, the most ancient document that we have which was issued by the judiciary commission of the ‘Giustizia Vecchia’ or Old Justice, at that time responsible for these matters. At the same time, Art became a School, which was a brotherhood of assistance and religion, and which held the right to participate in solemn public events with its own flag. The production, from texts dated 1280, was made up of tableware including glasses with bases boasting a few twirls of extra glass, making them look like crowns, or as in technical language , morise, and naturally phials too. In the same years glass decorators entered the scene and would paint the glasses using paints and enamels. Murano became the Queen of glass transparency only after the Maggior Consigio, on November 8th 1291 destroyed all the furnaces used for glassmaking in civitate vel episcopate Rivoalti thus allowing glass production on the island in the estuary and so the Muranese had the privilege of exclusivity , even though furnaces already existed there. From here on, with extreme protection for this economic source and by request by the ‘paroni de fornaxa’ furnace owners, it was decreed that anyone who went abroad to work glass could never return again to the island. Murano glass was held in such high consideration that when, in 1376, the Republican Government with its decision that if a Patrician family married a glassmaker’s daughter the children would also be considered nobles. A statute issued in 1315 declared that all ovens must have three outlets, so the most used oven had three levels. The first was used as a bed of wood which heated it and would reach the right temperature thanks to the intake of great quantities of air blown by strong bellows; the second one was used for the utensils and tools and where the raw materials for glass making were put, the third was for the mitten and this was where the finished objects were laid and had to cool slowly until reaching room temperature so as to avoid breaking due to thermal stress in the case of cooling too quickly. The basic tools that are used today in glass making are the same as are found in the historical engravings in Glass Museums all over the world. The types of wood mostly used for heating at the beginning were predominantly local kinds, alder and willow. The Venetian Lagoon after a short while couldn’t supply all the needs, so it was necessary to search further afield on the mainland. In 1285 a rule stated that only alder be used from then forth even though the word ‘alder’ seemed to mean all types of wood then not used for domestic use. The information we have regarding materials used brings us to guess that the basic ingredient for making the glass principle was silica, whether it was in the sand or extracted by the melting pots that came from the Venetian mainland. While sand was characterized by strong iron impurities, which made the product have a greenish-bluish end product, the bricks – in particular those really white ones from the Ticino river area – were much purer and destined for a more refined use. One must also consider, that the cost of this last item was rather high thus causing work to be done in a special way by heating quickly and cooling brusquely all to crush it and make it possible for an easier fusion. Silica melts at around 1700 degrees Celsius, needing a high almost excessive temperature for the means available back then so other ingredients were used to help the melting process like sodium and potassium. These were derived from the ashes of plants. The most frequent of these plants and protected by the Maggior Consiglio in an edict from 1306 was ‘Salsola Kall’ (The name generally refers to its salty taste, all those under the heading Kali = leads to the term meaning high content of salt (25%) and from its ashes these substances were extracted and sold under the name ‘plant soda’ or ‘cultivated soda’). In the city these soda ashes were known Syrian Ashes as they came from Syria in origin. Grepola (dialect) meaning the deposit left in wine barrels that were burnt and washed several times, could also be used until it became rubble and this brought carbonate potassium to the composition and was responsible for the shine in glass. 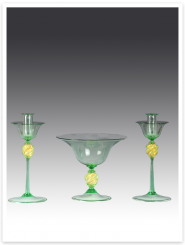 A fundamental moment in glass making was linked to the invention of the pontello which is a tool used for holding glass during production with the scope of refining the opposite piece of glass with extreme heat. This important tool made manual work possible without needing to refine it when cold, thus stimulating the fantasy and creativity of the Glass Masters that began their unending research for the beauty in the object itself. The turning point came in 1450 (chronology by Luigi Zecchin) the year in which Angelo Barovier began using much purer materials like silica which was treated, crystal salts obtained by an accurate purification of the ashes into a solid mass called ‘fritta’ and when Manganese from Piemont was added the transparency of ‘crystal’ was obtained, and remained unsurpassed until XVII Century. The fortune of this glass also supported by the fall of Damascus and the total collapse of the Syrian production, whose luxurious products were in demand in the western world and from which Venice adapted some of these forms. Angelo Barovier(1440?-1469) was a glass-master belonging to an important family from Murano whose family dates back to the early years in 1300. His entrance into glass can be found in a license dating 1442 where it said Jacopo Barovier’s son, Angelo, left his father to open his own glass business. Regarding the same family, in those years it was obligatory to note like in a legal document that in 1441 Salvatore had used the help of Elena Lando in decorating glass in his own furnace. Such information is interesting as it signals the first mention of a woman and also the first mention of painting on glass. Angelo was a disciple of the philosopher and alchemist form the Marche region, Paolo da Pergola, active in Venice as a public assistant in philosophy and theology in Saint John of alms church. Angelo, thanks to his lessons, put together a real chemical process and obtained transparent wires in glass, a term previously used with reference to the crystal from Rocca, but from then on a new type of glass was designed, totally transparent and impure and was could by compared to hard stone. 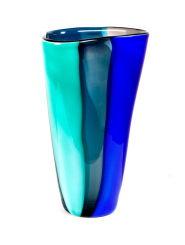 The new discovery gave the impetus for redesigning all compositions in so far as this didn’t interfere with coloured glass which still remained the particular glass in Murano, but contributed in enhancing the transparency. Resulting from this process, a new glass appeared and was called, porcelain, better known as lattimo, and this technique is perfect for the reproduction of the Ming Dynasty porcelain that appeared in Venice in 1442. With these new technologies people’s taste was also becoming more refined, an accomplice also being the explosion in all the fields of art, in this period, known as the Golden Age. And during this time frame enamels and gold were used in decorating and from 1469 were all worked ‘exclusively’ in the furnaces in Murano. For the reproductions there was a lot of imagery available from the canvases by Antonio Vivarini, Andrea Mantegna and Carpaccio to mention just a few, and they proposed biblical images, triumphant marches, mythological scenes as well as the faces of men and women enclosed in cameos or medals evoking solemn promises or marriage celebrations as is the case in the famous ‘Barovier Cup’,the original of which is still seen today in the Glass Museum in Murano. “More like purity in crystal than the brightness of glass, quite stunning at the base and in the cup part, that shine and glisten in such a way that, even if you weren’t thirsty the glasses would encourage it, as Petro Aretino defined some glasses he received as a gift. During the Golden Age glass production really reached its peak and is demonstrated by the visits of prominent personalities to the city as they were curious not only about the lace-like architecture in a city that mirrored itself in water , but also about Murano glass transparency. These were enriched with filigree when the Serena brothers announced to the Serenissima to have elaborated, after several studies, the technique of producing glass in small bands with wire lines and they asked for the privilege, which was a sort of copyright, for twenty five years. These brothers proposed a variant in glass, that Pietro l’Aretino, who was very active in the city, had had painted by Giovanni da Udine and made in the furnaces by two Muranese glass-masters, and in so doing they were called, aretini di fili spesse ( a thick wired technique). Another cause for pride was the great production of mirrors ever so refined and graceful in the shape that Leonardo Fioravanti, doctor and alchemist from Bologna, in his Dello specchio di scienza universale (Of glass in the scientific world), affirmed that “in no other place in the world, to date, had art with this perfection and beauty ever been made.” Regarding the refined glass made in this island Galileo Galilei also refers in 1609 when he goes up the bell tower with some Patrician Venetians to show them ‘the marvels and singular effects’ of his telescope made by him with lenses from Murano glass. The plague in 1630 hit very hard on the population in Murano which was once at 7400 and all lived on the island and along with their death many of the glass secrets died. If we also take into consideration that materials were also hard to find we can really refer to this as a profound crisis that boosted mass emigration abroad. The production was enriched by a new type of technique called, avventurina or star-effect paste, so-called for its minute copper crystals and shiny reflections. Otherwise the production used techniques already known. This decline lingered into the ‘700s, due to fierce competition and a political and economical situation of extreme incapacity to adapt to the novelties of the new Century, on behalf of this millenary structure like that of the Serenissima Republic. But desire and ideas in the furnaces on Murano didn’t follow this trend and almost to exorcize this moment , the production there in the ‘700s was dipped in an exhaltation of colour in glasses, jugs, table centerpieces, and the happy intuition to have enhanced the mirrors with a glass frame, made this object in particular the most important in ‘700 interior design. In this period, the most famous personality was most certainly Giuseppe Briati. He appears as a paron de fornasa (boss) and in 1724 he distinguishes himself, besides being deputy of the municipality of Murano and having the honour of seeing his family crest on coins, but also for the privilege granted by the Council of Ten, for the technique in refined crystal and obliging young artists to study it. Due to the envy caused by this privilege there was great danger to his and his workers lives, so this caused him to transfer his production to Venice. 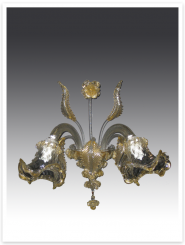 Then, he managed to complete his production of chiocche, old definition for chandeliers hailing from Murano and Venice. The innovation found itself privileged in Venice as it was a paste of terse crystal and valuable production of infinite work of the so named crystal, and in particular, in these magnificent chandeliers so wonderful so as to light the rooms for the rich and noble, the theatres and the streets on solemn occasions. The ongoing idea of working towards beauty, elegance and ethereal transparency that characterizes the work by Murano glass-masters who all affirm that Giuspee Briati showed that it was possible, if one wanted, not only to equal but to excel in other nations. It is this suggestion that all glass-masters in Murano accept every day of the week, in their challenge to express in full their millenary art, carried out with grace and delicacy, sweat and exertion, but above all with great pride to be part of a story.